Ashley Fu-Tsun Wang is a Taiwanese composer whose work draws on the eclectic nature of her musical palette, ranging from Western and non-Western classics to jazz and pop. Described by the New York Times as “Feldmanesque,” “punchy” and “frenetic,” she composes music that seeks to capture the transience of momentary beauty and individual identity through the juxtaposition of musical oppositions and through constant transformation and flow, revealing complexity within simplicity. 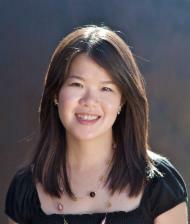 Ms. Wang’s music has been performed across North America, Europe, and Asia at venues including Carnegie Hall, Atlantic Center for the Arts, MASS MoCA, Aspen Music Festival, Roulette, The Stone, Hindemith Foundation (Switzerland), Logos Foundation (Belgium), Herz Jesu-Kirche (Germany), Villa Romano (Italy), Kitara Hall (Japan), Hong Kong Arts Centre (Hong Kong), Yong Siew Toh Conservatory (Singapore), and Song-Yi Concert Hall (Taiwan). She has collaborated with ensembles and performers such as Le Nouvel Ensemble Moderne, Brooklyn Rider String Quartet, MIVOS Quartet, members of Eighth Blackbird, pianists Eric Huebner, Vicky Chow, Jenny Q Chai, conductors David Gilbert, Brad Lubman, Paul Chiang, and visual artists Alice Grassi and Takeshi Moro. In 2010, Ms. Wang’s solo piano piece Intimate Rejection was released on Jenny Q Chai’s solo album “New York Love Song” on the ArpaViva Foundation Inc label. Recently Ms. Chai also premiered Current, which was reviewed as a “vibrant work,” and “the high point of the night, [full of] icily misty tonalities.” Ms. Wang’s music has been broadcast on WNYC and WQXR, and on Taukay Edizioni Musicali (Italy) and on Campo de Santa Clara, Lisbon (Portugal). She is the winner of the Yvar Mikhashoff Trust for New Music competition, the 15th Annual Piano Commission Award at the University of Illinois, the Look and Listen Festival Composition Prize, and the Award of Literature and Art Competition (2008 and 2010), and was recognized by International Music Prize, Fast Forward Austin Festival, Margaret Blackburn Composition Competition, and National Association of Composers, among others. She is also the recipient of an Encore Grant from the American Composers Forum, a Composer Assistance Program Award from New Music USA, and several ASCAPlus Award from the ASCAP Foundation. Her scores are now available through BabelScores, an online publishing platform based in France.